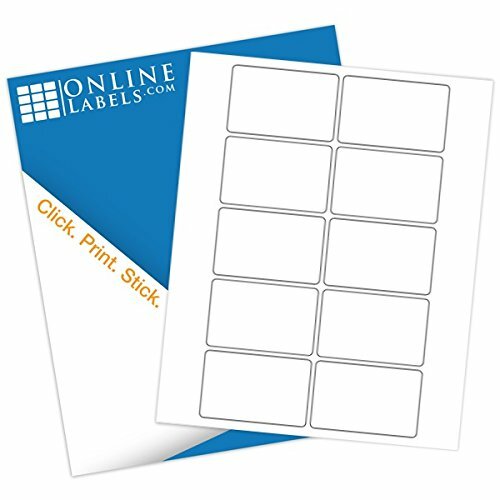 Printable 3" x 2" sticker labels on white matte adhesive paper, 10-up. Label your homemade products with DIY printable stickers. These round-corner labels are also great as address and shipping labels. They are designed to print and apply easily for a hassle-free experience. Print custom stickers using Maestro Label Designer, an exclusive design program for Online Labels customers. It's included in every order with your unique code listed on your order's packing list. When you're ready to print, our matte white label paper works in both laser and inkjet printers like HP, Canon, Brother, Epson, Dell, and more. Every order of our labels comes packaged in a hard plastic storage clamshell to keep your sheets protected during shipping and between uses.